Brivo is a SaaS company offering physical access control, video surveillance, and mobile credentials for commercial buildings. Currently serving over ten million users, Brivo provides a scalable and centralized security management system to its customers. Brivo is unique in offering both access control and video management in a single cloud-based platform that is available via web browser or mobile applications for anywhere, anytime management and control. Brivo Onair, our flagship product, allows you to monitor, manage and control your facilities in real-time from anywhere. Our customers use our platform to secure their buildings inexpensively with minimal hardware and only an internet connection. 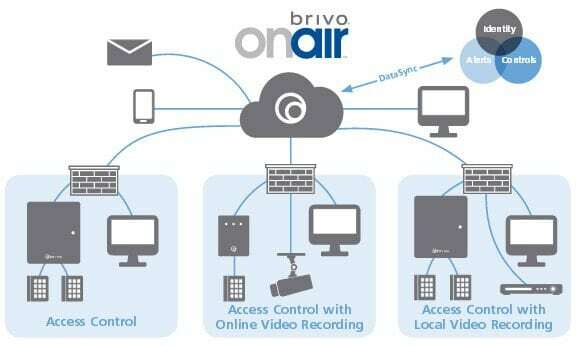 Brivo‘s Onair offering provides hosted entry control, video and ID badging for unlimited sites, devices and doors. You don’t have to cover the high costs of deploying or managing IT infrastructure or software, we deliver that through the cloud. with automatic updates at a fraction of the cost of on-premise solutions. readers, locks and alarm points via Brivo control panels and also supports a variety of 3rd party components such as video recorders and wireless locks. Among the built-in features are graphic maps, badge creation and printing, text/email event notifications, anti-passback and customizable reporting.